Gardening - Oranges and Lemons and other Citrus Charms. Oranges and Lemons - and other Citrus Charms. 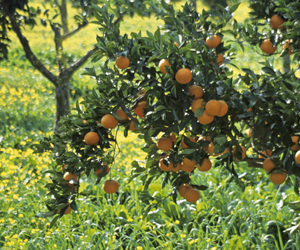 One of the most evocative and enduring images of Spain is the sight of an orange tree, shiny-leaved, with its intoxicating perfume and juicy fruits set against a clear blue sky. Luckily it's an achievable dream for none of the citrus are difficult to grow given reasonable conditions. Orange, lemon, mandarine, satsuma, clementine, grapefruit, lime and some of the more unusual hybrids such as kumquats, limequats etc - they are all evergreen and so attractive that they add a lot to any garden scheme or patio. And it's hard to beat that sybaritic delight of your own freshly squeezed orange juice for breakfast, the essential lemon in the gin and tonic or have you tried a mojito made with lime? There are some general rules to be applied when planning for and planting your citrus. Firstly, in order of ultimate height - grapefruit to around 15m, lemon 6m, orange 5m to 6m, lime 5m, mandarine, with its offshoots of satsuma and clementine, 3m to 4m and kumquats and limequats up to 3m. These are rough guides, as some modern varities are dwarfed. A 2 year old tree is the size generally offered; fine for bulk planting, you will need to wait another 2 to 3 years before you will get fruit from it. The tree will set fruit but you should break it off when tiny to build up the strength and structure of the tree instead of it expending all its energies in fruit production. At 4 to 5 years old, a tree can be allowed to come into production and by 7 to 8 years old it is at peak production, in which state it will continue for several years. Plant your tree in a fairly sheltered position (though lemons are tougher), backfilling with a mix of compost and garden soil; stake well. The citrus family need regular feeding, especially when carrying fruit, and can be prone to chlorosis, a yellowing of the leaves; correct this with a couple of doses of iron chelate. Watering should be regular and deep - avoid periods of dryness as this can cause general suffering to the tree and splitting fruit. Normally citrus don't need too much pruning, but keep the centre open to deter fungal diseases. One of the main problems is that of citrus leaf miner (minador de citrico). This small bug chomps channels through the leaves causing them to curl and preventing proper function. They especially like the new sweet young growth. Regular use of neem oil will prevent the problem and also mealy bugs and black mould, all of which can attack your citrus trees. There are two classes of grapefruit - the yellow and the pink. Marsh is a good yellow variety and Ruby, Red Marsh and Red Seedless are popular pink varieties. There are also two types of lemons but the most popular, by far, is the lunar lemon, which flowers and fruits throughout the year so that you can almost always pick a few lemons, instead of the tree bearing one large crop. Good varieties are Verna and Eureka. The most popular varieties of orange are Washington, Lane Late and Valencia. They are dual purpose eating and juicing oranges, sweet and juicy. Don't forget, too, the bitter orange which makes a highly ornamental tree and the blood orange for brilliantly coloured fruit. Bear in mind that by planting different varieties, you can extend your cropping season. The lime is the most tropical of the citrus - find it a sheltered spot - and you will probably only find Bears on offer here. Over the last few years mandarines have been regrouped into the common mandarine, the mandarine satsuma and the mandarine clementine or tangerine, the last two comprising the bulk of the market. Good varieties of clementine or tangerine are Clemenules and Fortune. The satsuma is the most cold resistant - try Hashimoto. The kumquat is one of the toughest of the citrus family and is ideal in a pot because of its small size and decorative nature. Nagami is the variety you'll most commonly see. The limequat is the result of a cross between kumquat and the lime; its juice is very bitter but tasty. Look for Eastis or Lakeland. The Moors certainly did us a great favour when they introduced the citrus into Spain and it has become one of our best-loved trees, both commercially and on a domestic scale. Few trees can produce such a wondrous crop of fruit, constantly look beautiful, and smell good too!